Are you ready to learn about Neonatal Respiratory Distress Syndrome? I sure hope so because that is what this study guide is all about. 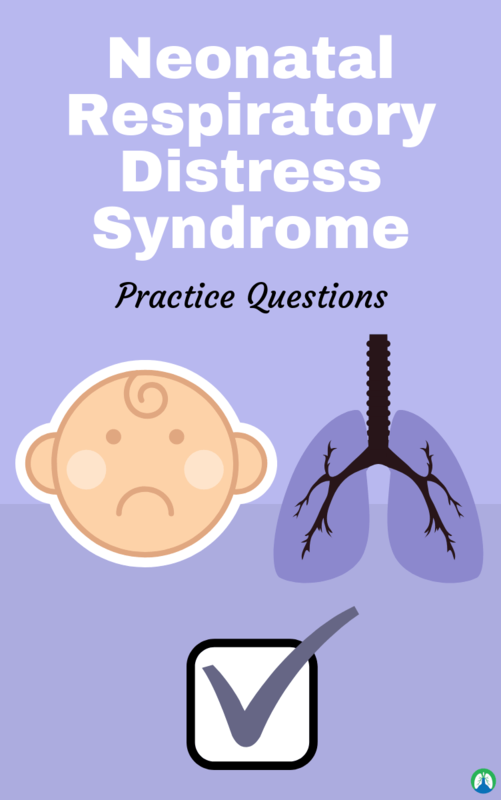 As you will see below, we have listed out some of the absolute best practice questions that cover the important topics about Neonatal Respiratory Distress Syndrome. My hope is that you can use this information to ace your exams in Respiratory Therapy school. So if you’re ready, let’s go ahead and dive right in! 1. What is characterized by the severe impairment of respiratory function? 2. What is RDS caused by? 3. What is the reason for immaturity of the lungs? 4. In the early 20th century, RDS was characterized as what? 5. What is hyaline membrane disease? It was a unique cellar character of the lung and thought to be a rare form of pneumonia. 6. What causes low alveolar compliance? 7. What is the biggest problem with RDS? 8. What causes difficulty in improving ventilation with poor maintenance of FRC? Over ally compliant chest wall. 9. What worsens gas exchange along with a thick alveolar-capillary (A-C) membrane? Increased distance between alveolar spaces and capillaries. 10. What is known as lung tissue underdevelopment? 11. What is the primary cause of respiratory distress? 12. What is a chemically complex agent whose main function is to stabilize the air-liquid interface of the alveoli and bronchiole and to lower surface tension? 13. What improves lung compliance? 14. What will happen if you have improved lung compliance? It will decrease the work of breathing. 15. What are surfactant molecules exerted and made of? 16. At what gestational week will surfactant appear? 17. Which cells in the alveoli produce surfactant? 18. What does surfactant do? It decreases the alveolar surface tension. It increases the lung compliance, and thus decreases the work of breathing. 19. What is the cause of Neonatal Respiratory Distress Syndrome? Pathology is due to a lack of surfactant due to the immaturity of the neonate’s lungs. This leads to an increase in surface tension, decreased compliance, and increased work of breathing and alveolar collapse. 20. What will a Neonatal Respiratory Distress Syndrome chest x-ray show? Will see these diffuse interstitial infiltrates. 21. Who is at risk for neonatal respiratory distress syndrome? Pre-term infants (born before <35 weeks). 22. What are some other risk factors for Neonatal Respiratory Distress Syndrome? 23. During what stage of lung development do pneumocytes develop? The saccular stage (week 26 to birth). 24. How do we test a pregnant mother to see if her baby’s lungs have reached maturity? Look at the Lecithin:Sphingomyelin ratio in the amniotic fluid. Both lecithin and sphingomyelin are lipids in surfactant- mostly lecithin that gives surfactant its qualities. 25. What lecithin molecule is most important in surfactant? 26. In NRDS, what is the Lecithin:Sphingomyelin ratio? Less than 1.5. A ratio of greater than 2.0 indicates a low risk for NRDS. 27. What happens to the oxygen tension in NRDS? 28. Persistently low oxygen tension within the blood can result in an increased risk for what cardiac complication? 29. What is the risk of decreased oxygen tension? 30. When is poor survival likely in neonates? Born before less than 24 weeks. 31. What are some interventions that can improve survival in neonates? Administration of maternal steroids before birth to accelerate lung maturation, Administration of artificial and exogenous surfactant after birth, and CPAP/intubation with oxygen support. 32. What are the complications of too much oxygen during the perinatal period? Retinopathy which is more involved with O2 tension- once the O2 is removed, the relative hypoxia in the eye causes blood vessel overgrowth- which can result in blindness. Intraventricular Hemorrhage and Bronchopulmonary Dysplasia are also complications of too much oxygen. 33. Why does RDS happen? It occurs because of a deficiency of alveolar surfactant, and is mainly seen in premies. It leads to alveolar collapse and reinflation with each breath – exhausts the baby and causes respiratory failure. 34. What signs can result from hypoxia in RDS? Reduced cardiac output, Hypotension, Acidosis, Renal failure, and Death. 35. What are the signs of RDS? Respiratory distress shortly after birth (in first 4h), and Tachypnoea (>60/min), grunting, nasal flaring, intercostal recession, cyanosis. 36. What would you see on a CXR in RDS? Air bronchograms and Diffuse granular patterns (ground glass appearance). 37. What are the differentials for RDS? Transient tachypnoea of newborn (due to excess lung fluid, normally resolves after 24h), Meconium aspiration, Congenital pneumonia (group B strep), Tracheoesophageal fistula, suspect if respiratory problems after feeds, and Congenital lung abnormalities. 38. How to prevent RDS? Betamethasone or dexamethasone to all women at risk of premature delivery from 23-35 weeks. 39. How to treat RDS? Delay cord clamping by 3 mins to promote placento-fetal transfusion. Give oxygen via o2/air blender at lowest possible concentration. If spontaneous breathing, stabilize with CPAP. If at high risk of RDS – give surfactant. 40. How would you manage baby born before 26 weeks in terms of RDS? Intubate, Prophylactic surfactant via ET tube, with ongoing doses if needed, Rock gently to aid spread to bronchial tree, Monitor O2, aim for 85%-93% sats to prevent RoP and bronchopulmonary dysplasia, wrap warmly and in incubator in SCBU/NICU, and If blood gases worsen – intubate and support ventilate before fatigue worsens. 41. What are the poor prognostic signs in RDS? Persistent pulmonary hypertension, Large right to left shunt via ductus, and Increased dead space fraction in lungs. 42. What is prognosis if hypoxia worsens despite everything? Baby is dying. Explain to parents, baby won’t feel pain, relieve pain and keep baby comfortable, disconnect tube so parents can hold. 43. What is bronchopulmonary dysplasia? Chronic lung disease in which premature infants treated with supplemental oxygen, requires long-term oxygen. More common in babies on prolonged mechanical ventilation for RDS. Due to prolonged high oxygen causing necrotizing bronchitis and alveolar septal injury with inflammation and scarring > hypoxemia. 44. Which group at most risk of BPD? Complicates ventilation for RDS in 40% of babies with birth weight less than 1kg. Barotrauma and oxygen toxicity. It can also be surfactant related. 46. What is seen on investigations for BPD? CXR shows hyperinflation, rounded radiolucent areas, alternating with thin, denser lines. 47. What are early signs of BPD? Reduced IQ, cerebral palsy, feeding problems, oxygen desaturation during feeds. 48. What are late signs of BPD? By adolescence/early adulthood the main changes remaining are airways obstruction, airway hyperactivity and hyperinflation. 49. How can BPD be prevented? Steroids (ante and postnatally), Surfactant, and High-calorie feeding. 50. When do you suspect pulmonary hypoplasia? All infants with persistent neonatal tachypnoea and feeding difficulties, especially if prenatal oligohydramnios. In a diaphragmatic hernia, it is due to a ‘SOL’. It can also be due to cystic adenomatoid malformations. 51. What is the number one reason for admission to the NICU? Respiratory distress, pulmonary is the main cause, and non-pulmonary is CV. 52. What must we do before we determine the cause of respiratory distress? Stabilize the infant. We don’t often know the cause because we treat all the babies the same. 53. What are the 4 most common causes of respiratory distress? Respiratory distress syndrome (RDS)– like her case, Transient Tachypnea of the Newborn, Pneumonia/Aspiration syndromes, and Pneumothorax. 54. What is most common pneumonia? Perinatal pneumonia which is acquired in utero. Chlamydia pneumonia which is present later in life, 4-12 weeks, staccato cough, but no wheezing and fever, chest x-ray has bilateral infiltrates, eosinophilia, get macrolides for treatment. 55. How do we assess fetal lung maturity? Amniocentesis (check the fluid in utero, only done in high risk), Lecithin, and phospholipid. 56. What is a more specific indicator of lung maturity in babies? 57. When are mature alveoli present? 58. What helps the neonates to get a good first breath? Vaginal delivery that causes intermittent compression of the thorax and helps with the removal of lung fluid. Surfactant helps to decrease surface tension which lowers pressure needed to open the alveoli. 59. What are the 6 parts of the definition of respiratory distress? Cyanosis, and decreased breath sounds. 60. What are the tests that must be done for respiratory distress? Chest x-ray, serum glucose, blood gas, CBC with differential, CRP, blood culture, obtain maternal history (diabetes, premature, ultrasound abnormalities), details of labor and delivery (where was placenta). 61. What should you rule out with respiratory distress? Cardiac disease; via murmurs, gallops, poor capillary refill, weak/delayed pulses, single heart sound, central cyanosis, hyperactive precordium. 62. What is respiratory distress syndrome formerly known as? 63. When do we most often see respiratory distress syndrome? 60-80% of babies less than 28 weeks. 64. What are the causes of respiratory distress syndrome? Surfactant deficiency which causes an increase in surface tension and alveolar collapse, they cannot establish and maintain an FRC (functional residual capacity) and then the lungs become atelectatic. Classic chest x-ray appearance for respiratory distress syndrome ground glass appearance, diminished lung volume, air bronchograms. 65. Which disease has a ground glass appearance in the x-ray? 66. What is the ABG of a child with respiratory distress syndrome? Hypoxemia, hypercapnia, and metabolic acidosis. 67. When do symptoms of respiratory distress syndrome appear? Within minutes of birth, worsens over time, if apnea and irregular breathing treat them. 68. How do we treat respiratory distress syndrome? IV fluids and keep the temperature within the normal range, keep oxygen between 85% and 95%, CPAP, endotracheal intubation, and surfactant delivery. 69. What is surfactant replacement therapy? It can have synthetic or natural, give as soon as you can after they are born and improves chest x-ray, give 3 doses usually. 70. How can we prevent respiratory distress syndrome? should also avoid c-section if unnecessary. Give prophylactic doses of surfactant to premature infants. 71. What is the biggest complication of respiratory distress syndrome? Chronic lung disease (bronchopulmonary dysplasia). 72. What can be developed if a child has bronchopulmonary dysplasia? Asthma retained fetal lung fluid syndrome, and same as transient tachypnea of the newborn. 73. What are the risk factors of transient tachypnea of the newborn? Male gender, C-section, perinatal asphyxia, umbilical cord prolapse, maternal asthma, diabetes, and anesthesia in delivery. 74. What is the transient tachypnea of the newborn pathogenesis? Early onset of tachypnea, occasional retractions, grunting, cyanosis; cyanosis fixed if given a bit of oxygen; chest clear, fixed in 1-5 days with minimal intervention. 75. What is the key x-ray finding with transient tachypnea of the newborn? Fluid in the interlobar fissures, also increases interstitial markings. 76. What are the treatments for transient tachypnea of the newborn? Supportive, sometimes CPAP, some oxygen, and NPO IV fluids. 77. What is meconium aspiration syndrome? Respiratory distress in infant delivered through meconium-stained amniotic fluid, no other sources of distress. 78. Meconium passing is usually a sign of what? Fetal distress, also often seen in post-term babies. First stool, water, toxic to the lungs and causes pneumonitis. 80. What is a major problem with meconium? It displaces surfactant; also activates complement which leads to inflammation. 81. When do the meconium aspiration syndrome kids present? First 12 hours of life, from thick particulate meconium aspirated into lungs, on first breath or in utero. 82. What do you hear on auscultation with meconium aspiration syndrome? 83. What is the specific symptom of meconium aspiration syndrome? Barrel chest from overdistension and obstruction. 84. What is the chest x-ray meconium aspiration syndrome? Patchy atelectasis, areas of over inflation which severe can have total white out of lungs. 85. What is the treatment for meconium aspiration syndrome? Supportive care get surfactant to overcome the surfactant displacement. Sometimes get ECMO, inhaled nitric oxide. 86. What is the purpose of inhaled nitric oxide with meconium aspiration syndrome? 87. When do we use ECMO? If a kid has meconium aspiration syndrome that fails inhaled nitric oxide. 88. What is used in the prevention of meconium aspiration syndrome? Prompt delivery is the key. Now, it is not required to intubate if meconium is present, we treat them like other babies and check. 89. What is a major complication of meconium aspiration syndrome? 90. What is the persistent pulmonary hypertension of the newborn? inadequate ventilation that leads to impaired pulmonary transition; causes the release of pulmonary vasoconstrictors and this leads to pulmonary hypertension. 91. What is the cause of respiratory distress syndrome? 92. What is the cause of transient tachypnea of the newborn? 93. What causes meconium aspiration syndrome? Toxic properties of meconium on the lungs. 94. A radiograph that reveals increased interstitial markings with fluid in the interlobar fissures in an infant who has respiratory distress is most likely to represent? 96. What is sudden infant death syndrome? Sudden unexplained death before 1 year of age, usually occurs in a previously healthy infant and the cause of death remains unexplained. 97. SIDS is more likely to occur in which infants? So there you have it! That wraps up our study guide on Neonatal Respiratory Distress Syndrome. I hope that this information was helpful for you. I’m confident that if you go through these practice questions a few times, you can easily develop a good understanding of this information. And it’s very important that you do so, especially if you want to work with kids some day. Thank you so much for reading and as always, breathe easy my friend.